What is Managed Software Center? Managed Software Center (MSC) is a tool for enterprise application and software deployment and maintenance on the macOS. What can I do with MSC? 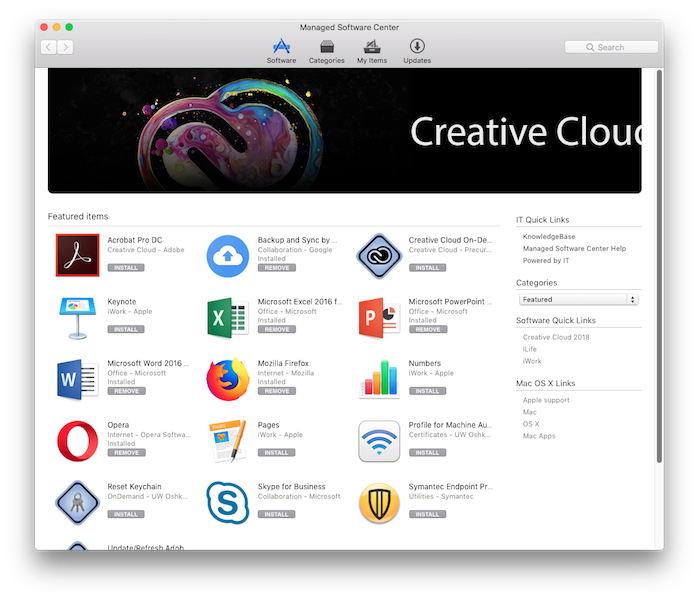 With MSC users can install campus applications, upgrade the macOS, and install printers. 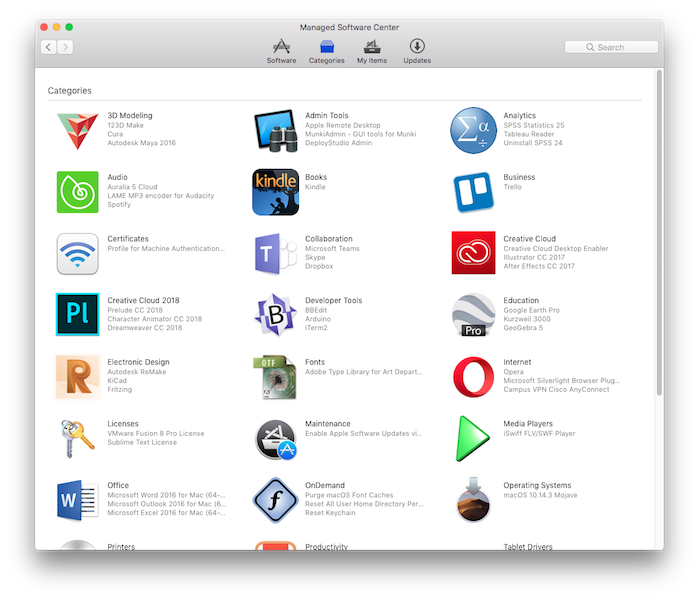 MSC's interface is very, very similar to that of Apple's Mac AppStore: items are grouped in categories, items are searchable, and a list of all items installed by the user is available for those times when you need to make more space on your hard drive. How do I get MSC? While MSC works on or off campus, the installation currently needs to be run on campus. NOTICE: Initial installation requires your computer be connected to the Internet with either an ethernet connection or the TitanWiFi Hardware Authorization Profile. Failure to have either of these kinds of connection will cause the first check-in at the login window after restart to fail without meaningful warning. 2. Download the zip package from Google Drive. Double Click on the zip to extract the pkg. 3. Double click the pkg to start the installer which will guide you through the installation process. 4. Your computer will restart. 2. After the program loads, you will be presented with the Featured Items screen of MSC. This screen lists some of the more popular, most requested software pieces available to UW Oshkosh employees. 3. Browse through the applications available. 4. Click Install on any that you'd like to install. You can also click on the Categories tab to sort the applications into groups. Type in the Search box in the upper right corner of the window to find applications by keywords. If you do not find the application you are looking for, please contact the Help Desk to start the MSC application request process. Most popular applications can be packaged and delivered through MSC. 5. The download will begin and is noted by the "Downloading" identifier and "Downloading" progress bar on the Updates page. 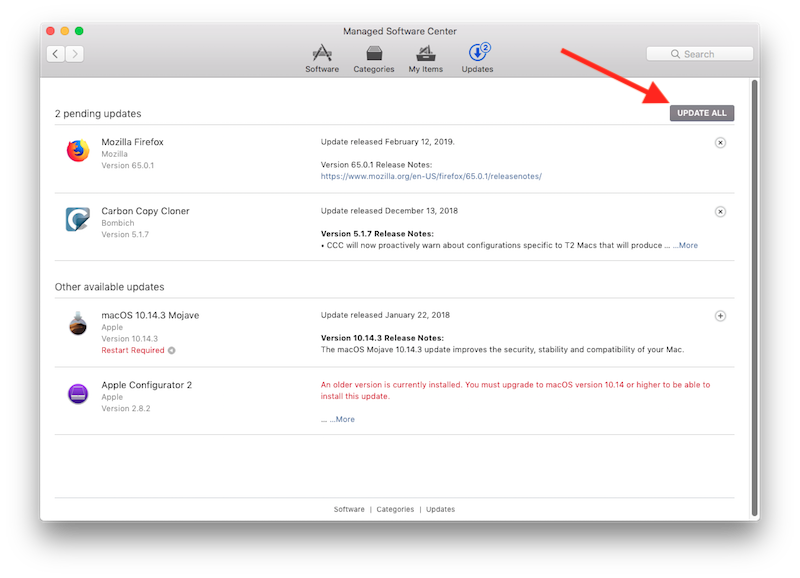 On some occasions you will open MSC and it will default to the updates screen. You will see a list of one or more items that are pending for install. Additionally, MSC will automatically open and show this same update screen, placing a number in a red badge on the MSC icon in your Dock and on the Updates tab selector itself. These are updates to programs currently installed on your computer. If you see a little "x" next to an update item this means that you can cancel that particular update. This does not show up for all items. Pay close attention to any red text at the top of this Updates screen. This Updates screen is the best location to verify what needs to be installed as well as to see a list of software that you've currently requested to be installed. Be mindful of any updates/installs that have Restart Required in red text in their line. When you are satisfied with the list of updates and installations that have been queued up AND have saved all your open documents to avoid data loss during a required restart, click Update All to begin downloading and installing the software packages. This message will inform you that one or more updates have an "install by" date and time. The update(s) that have due dates will also show their install by information in their line item. DO NOT ignore this warning. You may safely postpone these updates by closing the application. However, once the due date has arrived your computer will begin a countdown (usually 30 minutes) to do those installs. Only software offered by MSC can be removed by MSC. 1. Search for the program in the Software screen, the Categories screen, or by doing a keyword search using the Search Box in the upper right corner. 2. Once you find the software you want removed, you can click Remove to initiate its removal. 3. Once any of the removal buttons is clicked in MSC it will initiate the software removal process. 4. When that process is complete, MSC will notify you that the application "Will be removed." In this example Opera has a remove button. You can click on it to initiate a removal. Clicking on the Updates screen, you will see a list of software to be removed. If you wish to cancel the removal, click the "x" to the far right of the item. You can also click on the name of the application in the list to go to its product description page and click a bigger Cancel Removal button. Below is an example of said button for Firefox. If an application doesn't seem to be installing, click the 'x' in the upper right corner next to the app in the updates window. This will remove the application from the updates Queue. Once it's been removed from the update queue, re-download the update or application. If the problem still persists or you need further assistance, contact the Information Technology Help Desk at 920-424-3020 or helpdesk@uwosh.edu.